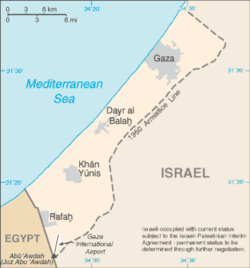 The Gaza Strip (Arabic:Qita' Ghazzah; Hebrew:Retzu'at 'Azza) is a narrow coastal strip of land along the eastern Mediterranean Sea, between Egypt and Israel, just northeast of the Sinai Peninsula. It is considered to be part of the "Cradle of Humanity," with a long and full history. Following the 1948 creation of the State of Israel, hundreds of thousands of Palestinians were forced into refugee camps, with most of the refugees from the southern part of Israel ending up in Gaza. This small area harbors a large refugee community that is a hotbed of militarism as the community suffers from high unemployment and limited security and is riven with factions struggling for sovereignty. As of 2008, Gaza is neither a state nor a nation. It is at best a community without a functioning economic base or credible political structure. Decades of instability and uncertain political status while being a welfare client of the United Nations set the stage for further collapse when Israel responded to the Intifada of 1990 by imposing constraints on Gazans exiting or entering Gaza, on Gazan supplies of medicine, fuel, and other basic goods, on Gazans transporting crops to export markets, and on their use of electric lights. The travel constraints alone have left many Gazans without a functioning economic base because they have lost access to employment opportunities in Israel. Present day Gaza feels to many as a prison of sorts. Israel controls the Gaza strip's airspace and offshore maritime access. Due to the continuing conflict with Israel, its 1.4 million inhabitants on 130 square miles are unable to enter neighboring Israel or Egypt, and there is little local economic activity in this potentially rich area to alleviate the widespread poverty. The territory takes its name from Gaza, its main city. The Gaza Strip has a 32-mile (51km) border with Israel, a seven-mile (11km) border with Egypt, and an area of 139 square miles (360km²), slightly more than twice the size of Washington, DC. The terrain is flat or rolling, with dunes near the coast. The highest point is Abu 'Awdah ([Joz Abu 'Auda]]), at 344 feet (105 meters) above sea level. The Gush Katif bloc of Israeli localities used to exist on the sand dunes adjacent to Rafah and Khan Yunis, along the southwestern edge of the 25-mile (40km) Mediterranean coastline. A few months after Israel's unilateral disengagement plan in December 2005, a controversial buffer zone was created on the northern border with Israel. Part of it reaches 1.5-mile (2.5km) into the Palestinian Authority controlled territory, on roughly the area of the former northern Israeli localities, an area used to launch Qassam rockets into Israel. 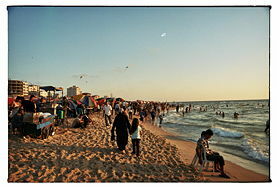 Crowded beach in Gaza City. The Gaza Strip has a temperate climate, with mild winters, and dry, hot summers subject to drought. January is the coldest month with average temperatures ranging from 43°F to 59°F (6°C to 15°C) and July and August are the hottest months at 72°F to 91°F (22°C to 33°C) on average. Natural resources include arable land (about a third of the strip is irrigated), and recently discovered natural gas. Environmental issues include desertification, salination of fresh water, inadequate sewage treatment, water-borne disease, soil degradation, and depletion and contamination of underground water resources. Gaza, the largest city, has a population of approximately 400,000. It is frequently termed "Gaza City" to distinguish it from the Gaza Strip. Other cities include Rafah, and Khan Yunis. Several towns are located along the coast between Rafah and Gaza City. Beit Lahia and Beit Hanoun are located to the north and northeast of Gaza City, respectively. Gaza has been the site of pre-human and human occupation for more than two hundred thousand years. Mousterian Neanderthals appear to be the earliest human inhabitants, around 200,000 B.C.E. Strategically located on the Mediterranean coastal route, ancient Gaza was a prosperous trade center and a stop on the caravan route between Egypt and Syria. The city was occupied by Egypt around the fifteenth century B.C.E. The Philistines, a sea-faring people possibly from Crete, invaded the southern coast of Canaan, (c. 1180 to 1150 B.C.E.) around the time of the arrival of the Israelites. Their territory was later named Philistia, and Gaza became one of their chief cities. Canaan is an ancient term for a region approximating to present-day Israel and the West Bank and Gaza, plus adjoining coastal lands and parts of Lebanon and Syria. The Philistines long held a monopoly on iron smithing (a skill they possibly acquired during conquests in Anatolia), and the biblical description of Goliath's armor is consistent with this technology. The biblical stories of Samson, Samuel, King Saul, and David include accounts of Philistine-Israelite conflicts. Of interest is the fact that the Arabic word for Palestine, فلسطين‎, is pronounced "Filistīn." Cyrus II of Persia conquered the Babylonian Empire by 539 B.C.E. and organized the empire into provincial administrations called satrapies. The administrators of these provinces, called satraps, had considerable independence. The Persians allowed the Jews to return to the regions that the Babylonians had exiled them from. In 145 B.C.E. Gaza was conquered by Jonathan Maccabaeus the Hasmonean (Brother of Judas Maccabeus the Maccabee). There was a prospering Jewish presence in Gaza until the Roman ruler Gavinius expelled them in 61 C.E. The failure of the Bar Kokhba's revolt against the Roman Empire in 132 C.E. resulted in a large-scale expulsion of Jews. It was during this time that the Romans gave the name Syria Palaestina to the geographic area, in an attempt to erase Jewish ties to the land. In the times of the Mishnah and the Talmud, around 200 C.E., there was a large Jewish community in Gaza, and on one of the pillars of the Great Mosque of Gaza there was a Greek inscription which read "Hananiah bar Yaakov" (a Hebrew name) with a menorah carved above it. This was chiseled off between 1987 and 1993, during the intifada. The remains of the ancient Gaza synagogue, built around 500 C.E., were found near the city wharf. 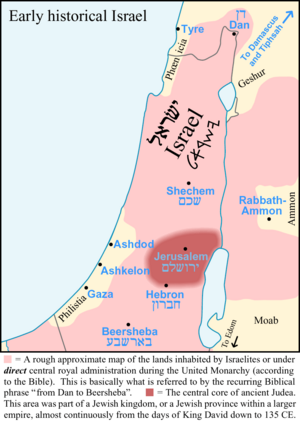 Gaza was captured by Arabs in the 630s after a siege during which the Jewish population of the city defended it alongside the Byzantine garrison. Believed to be the site where Muhammad's great grandfather was buried, the city became an important Islamic center. The area was ruled by the Muslim Omayyads, then by the Abbasids. In the twelfth century, Gaza was taken by Christian Crusaders, and it returned to Muslim control in 1187. It was ruled by the Kharezmians and Mongols, before becoming part of the empire of the Mamluks (1260-1516) and the Ottoman Empire in 1517. Gaza remained under Ottoman rule for 400 years, until 1917. Mandated by the League of Nations, the British took control of the region in 1919 at the time of withdrawal of the Ottomans, during World War I. In 1922, after the collapse of the Ottoman Empire, the British Mandate of Palestine was established. The future of Palestine was hotly disputed between Arabs and the Zionist movement. In 1947, the United Nations Partition Plan proposed a division of the mandated territory between an Arab and a Jewish state, with Jerusalem and the surrounding area to be a corpus separatum under a special international regime. The regions allotted to the proposed Arab state included the Gaza Strip and almost all of the West Bank, as well as other areas. Jewish groups (notably the Jewish Agency) generally supported the partition plan. Arab groups (all Arab countries in the U.N. voted against it) rejected the plan and subsequently invaded the newly formed State of Israel, starting the 1948 Arab-Israeli War. After the war, Israel controlled many of the areas designated for the Arab state, and the negotiated agreements established Armistice Demarcation Lines, which did not have the status of recognized international borders. Egypt took control over Gaza and its surrounding area. The Egyptians never accepted the inhabitants as legal citizens of Egypt and thus prohibited them from leaving Gaza Strip. Israel captured the city and the Gaza Strip during the 1967 Six Day War, and Gaza remained occupied by Israel for the next 27 years with smaller territory, as large sections of land have been confiscated by Israel. At the beginning of the Israeli occupation, relations between Israelis and citizens of Gaza were pleasant. Both sides tended to cross the borders—the Palestinians in order to work in Israel, and Israelis to buy cheaper–priced goods. With the onset of the Palestinian uprising known as First Intifada (uprising) in 1987, Gaza became a center of political unrest and confrontation between Israelis and Palestinians, and economic conditions in the city worsened. In September 1993, leaders of Israel and the Palestine Liberation Organization (PLO) signed the Oslo Accords calling for Palestinian administration of the Gaza Strip and the West Bank town of Jericho, which was implemented in May 1994. Most Israeli forces left Gaza, leaving a new Palestinian National Authority to administer and police the city, along with the rest of the Gaza Strip. 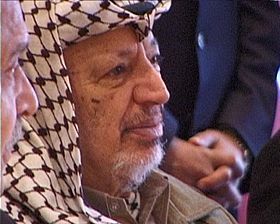 The Palestinian Authority, led by Yasser Arafat, chose Gaza as its first provincial headquarters. In September 1995, Israel and the PLO signed a second peace agreement extending the Palestinian Authority to some West Bank towns. The agreement also established an elected 88-member Palestinian Council, which held its inaugural session in Gaza in March 1996. However, following the establishment of the Palestinian National Authority in 1993 and the subsequent normalization of relations with Jordan in 1994, the expected progress towards full sovereignty did not follow nor did the living conditions of the Palestinians improve. 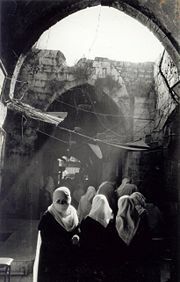 Consequently, the second Intifada erupted in 2000, following the visit to the Temple Mount in Jerusalem of Israeli Prime Minister, Ariel Sharon. Increasingly, suicide bombings of Israeli targets became a popular method of resistance. In February 2005, the Israeli government voted to implement Prime Minister Ariel Sharon's plan for unilateral disengagement from the Gaza Strip beginning on August 15, 2005. The plan required the dismantling of all Israeli settlements there, transferring the lucrative hot house industry to Palestinian control to spur economic development, and the removal of all Israeli settlers and military bases from the Gaza Strip, a process that was completed on September 12, 2005, as the Israeli cabinet formally declared an end to military rule in the Gaza Strip after 38 years of control. The withdrawal was highly contested by the nationalist right in Israel, particularly the religious Nationalist Tendency. Following withdrawal, Israel retained offshore maritime control and control of airspace over Gaza Strip. Israel withdrew from the "Philadelphi Route" that is adjacent to the Strip's border with Egypt. Hamas's election as the government of the Palestinian National Authority in January 2006 resulted in another impasse in peace negotiations between Israel and Palestine. Hamas does not recognize Israel and, unlike the PLO and other Palestinian factions, remains committed to the total destruction of Israel. The situation of the Gaza Strip, and of the entire Middle East, has proven intractable to political solution. A new approach is required, one which mobilizes religious and cultural resources of peace that can change the attitudes of the populace. A popular and religious-based movement is needed to enable the people of Israel and Gaza to seek a world without the boundaries and barriers raised by faith and the identities of nation, race, or ethnicity. Such a spiritual concept, that human beings are one family under God, could guide political leaders and give them the support needed for a breakthrough. A solution to the problem of Gaza should be linked to local and regional economic development. Gaza has the potential for great prosperity, through hothouse agriculture, tourism with some of the finest beaches on the Mediterranean Sea, and local industry. Economic development, not UN handouts, should provide employment, wealth and self-respect to the people of Gaza. The key political challenge facing the government of Gaza is to build a genuine indigenous national unity that would transcend sectarian loyalties. Based on that unity, economic development could proceed, lifting the per capita GDP rank from 166 on the list of UN's list of 194 nations. These are the needs of the Gaza Strip. Currently some Gaza people and groups believe in the pursuit of their "liberation" through the use of deadly violence, even perpetrated against innocents. Regardless of how much one might sympathize with the plight of Gaza residents, or "Palestinian causes," such behavior must be condemned; it is also counterproductive to the cause of Palestinian self-determination. It should be brought to an end through the determined support and action of the world's religious and political leaders to resolve the situation and help to dissolve the resentment between the parties. 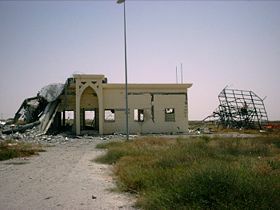 Damaged section of Yasser Arafat International Airport. The Gaza Strip and its population is under the nominal jurisdiction of the Palestinian National Authority, a provisional government that also nominally governs parts of the West Bank. The authority also operates the Gaza Strip's Rafah border crossing into Egypt under European Union supervision. The crossing has been closed sporadically due to Israeli demands since June 2006, after a series of terrorist attacks by Palestinian militants were launched against Israel. Prior to Israel's unilateral withdrawal, the United States considered the Gaza Strip to be Israeli-occupied territory. Following the withdrawal, no official government statement has been made on its present status. However, the CIA World Factbook, updated in March 2007, continued to define the Gaza Strip as "Israeli-occupied." Israel, the United States, and the European Union have frozen all funds to the Palestinian government since Hamas's victory in the 2006 elections. They view the group as a terrorist organization and have pressured them to recognize Israel and renounce violence. According to the Palestinian "Basic Law" which was signed by former president Yasser Arafat in 2002 after a long delay, the structure of the Palestinian Authority is based on the three separate branches of power—executive, legislative, and judiciary. The judiciary has yet to be properly formalized. The president of the Palestinian Authority is directly elected by the people, and the holder of this position is considered to be the commander-in-chief of the armed forces. In an amendment to the Basic Law, approved in 2003, the president appoints a "prime minister" who is also chief of the national security services. The prime minister chooses a cabinet of ministers and runs the government, reporting directly to the president. The Palestinian Legislative Council, an elected body increased to 132 representatives that acts as a parliament, must approve all cabinet positions proposed by the prime minister, and must also confirm the prime minister upon nomination by the president. Half the legislative council must be elected under a system of proportional representation and half by traditional constituencies. The judiciary is nominally independent, and subject to the law, and was, in 2007. The Basic Law calls for the establishment of a Supreme Judicial Council, Islamic Sharia’ courts, and military courts. High population density, limited land access, and strict internal and external security controls have kept economic conditions in the Gaza Strip—the smaller of the two areas under the Palestinian Authority (PA)—even more degraded than in the West Bank. 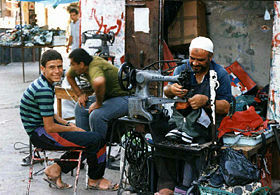 The beginning of the second intifada in September 2000 sparked an economic downturn, largely the result of Israeli closure policies. These policies, which were imposed to address security concerns in Israel, disrupted labor and trade access to and from the Gaza Strip. In 2001, and even more severely in 2003, Israeli military measures in Palestinian Authority areas resulted in the destruction of capital, the disruption of administrative structures, and widespread business closures. The Israeli withdrawal from the Gaza Strip in September 2005 offered some medium-term opportunities for economic growth, which have not yet been realized due to Israeli military activities in the Gaza Strip in 2006, continued crossings closures, and the international community's financial embargo of the Palestinian Authority after Hamas took office in March 2006. The Israeli settlers of Gush Katif built greenhouses and experimented with new forms of agriculture. These greenhouses provided employment for many hundred Gazan Palestinians. When Israel withdrew from the Gaza Strip in the summer of 2005, these greenhouses were bought by the World Bank and given to the Palestinian people to jump-start their economy. Most of these greenhouses have now been looted or destroyed. As of December 2006, unemployment rose from 23 percent in 2005 to over 50 percent. In the previous four months, approximately 10,000 emigrated from the territories, and approximately 50,000 have applied to do so. For the previous nine months, the 160,000 civil service workers, who are the breadwinners for a third of households, did not receive their full salaries due to the cuts in foreign aid. Gaza Strip industries are generally small family businesses that produce textiles, soap, olive-wood carvings, and mother-of-pearl souvenirs; the Israelis have established some small-scale modern industries in an industrial center. Electricity is supplied by Israel. The main agricultural products are olives, citrus, vegetables, Halal beef, and dairy products. Primary exports are citrus and cut flowers, while primary imports are food, consumer goods, and construction materials. The Gaza strip has a small, poorly developed road network. It also had a single standard gauge railway line running the entire length of the strip from north to south along its center. However, it is abandoned and in disrepair, and little track remains. The line once connected to the Egyptian railway system to the south as well as the Israeli system to the north. The strip's one port was never completed after the outbreak of the Al-Aqsa Intifada. Its airport, the Gaza International Airport, opened in November 1998 as part of agreements stipulated in the Oslo II Accord and the Wye River Memorandum, was closed in October 2000 by Israeli orders, and its runway was destroyed by the Israel Defense Forces in December 2001. It has since been renamed Yasser Arafat International Airport. The Gaza Strip has rudimentary landline telephone, extensive mobile telephone services, and four internet service providers. Most Gaza households have a radio and a TV, and roughly 20 percent have a personal computer. Residents have access to satellite television (Al Jazeera, Lebanese, and Egyptian entertainment programs), local private channels, and broadcast TV from the Palestinian Broadcasting Corporation, the Israel Broadcasting Authority and the Second Israeli Broadcasting Authority. Exports (for Gaza and West Bank) totaled $301 million in 2005. Export commodities included citrus, flowers, and textiles. Export partners included Israel, Egypt, and the West Bank. Imports totaled $2.44 billion. Import commodities included food, consumer goods, and construction materials. Import partners included Israel, Egypt, and West Bank. According to the CIA World Factbook, GDP in 2001 declined 35 percent to a per capita income of $625 a year, and 60 percent of the population was below the poverty line. The Fact Book ranks Gaza at 166th place on a list of 194 countries. Around 1.37 million Palestinian Arabs live in the Gaza Strip. Population density is 8227 per square mile (3177 per square kilometer). The majority of the Palestinians are direct descendants of refugees who fled or were expelled from their homes when Israel was created during the 1948 Arab-Israeli War. The Gaza Strip population has continued to increase since that time. The large refugee population means the United Nations Relief and Works Agency provides health, educational, and social services. A study carried out for CARE International in late 2002 found that 17.5 percent of children suffered from chronic malnutrition, while 53 percent of women of reproductive age and 44 percent of children were found to be anemic. About 60 percent of the population is under the age of 15. Infant mortality is 32 per 1000 live births, and average life expectancy 72 years. Canaanites are considered to be among the earliest inhabitants of the region today known as Palestine/Israel, Canaan being its earliest known denomination. Some of the Canaanites are believed to have migrated in the third millennium B.C.E. from the inner Arabian Peninsula. In 2007, Palestinian Arabs and others made up 99.4 percent of the population, while Jews make up 0.6 percent. The population is categorized according to residential status. There are indigenous Gazans, permanently settled refugees, and residents of refugee camps. Around 52 per cent of Gazans live in urban centers. Indigenous Gazans comprise only 40 per cent of the area’s total population, though they hold disproportionate influence in economic and political affairs. Other than a dwindling community of 2000 Christians, the residents are almost entirely Sunni Muslims. Historically, there has been a Jewish presence in the region. However, on several occasions, the most recent being as a result of Israel's unilateral disengagement plan in 2005, they have been asked to leave. The Islamic holy book, the Kor'an, sets out rules for everyday behavior as well as religious doctrine, so religion, politics, and culture are bound together in Muslim communities. An imam (spiritual leader) delivers a weekly sermon at a mosque on Fridays. The primary language of the Palestinians is Arabic. Israelis speak Hebrew, which is also spoken by many Palestinians. English is widely understood. Arabic is the largest living member of the Semitic language family in terms of speakers. Classified as Central Semitic, it is closely related to Hebrew and Aramaic. Women are restricted to homemaking or local cottage industries, since many Palestinian men consider it unacceptable for women to work outside the home. Women dress in the traditional Muslim jilbab, a long jacket-like dress, with a scarf to cover the hair. Men are the center of Palestinian life. The family patriarch is the key decision-maker regarding living arrangements, children's marriages, and money. Women must obey their father or husband. Polygamy is common, and up to four wives are allowed, but most Palestinian men have only one or two wives. When a couple wishes to marry, the man approaches the woman's family. They declare their engagement, and the families get to know one another. This tradition is weaker in urban areas and among university students. A wedding is an occasion for singing, dancing, and feasting. The couple exchanges vows in a Muslim ceremony called the Katb al-Kitab. The extended family is the strongest social unit, and members share a household. Married children live with their parents. Elderly parents are cared for at home by the families of their children. If a man with several wives can afford a large house, each wife gets her own rooms. But houses in Gaza tend to be small and lack privacy. Palestinians are proud of their children. An infant boy's circumcision is celebrated. Extended families help in caring for infants and young children. 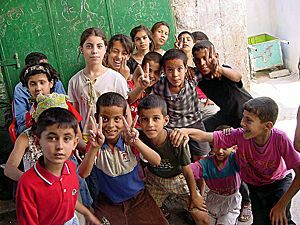 The school system in Gaza is based upon Egypt's model, which is divided into three stages: Basic education, which includes a primary stage and a preparatory stage; secondary education and post-secondary education. There are numerous literacy and cultural centers. Most children get a free public education from kindergarten through high school. Children from well-to-do families may attend an Islamic or a Christian school. There are eight Palestinian universities and four colleges, all of which grant bachelor's degrees in arts and sciences. A few offer graduate programs. A total of 91.9 percent of the population aged 15 and over can read and write. Before the Israeli unilateral disengagement in 2005, Jewish Israeli settlements were separated from Palestinian communities, and the best roads, shopping centers, jobs, and services were in the Israeli areas. Palestinians resented this. Within the Palestinian community there are two distinct cultures—the privately educated Palestinians, who lived in the United States or Europe before their parents returned in the mid-1990s, and the majority who lived through the Israeli occupation. The returnees got the best jobs, and many flaunt money and vehicles. The majority lives in poverty. The gulf between rich and poor may be a bigger problem than attaining Palestinian sovereignty. Thousands of Gaza's inhabitants live in refugee camps that have gradually become permanent settlements. The crowded camps comprise small concrete-block huts with corrugated metal doors and roofing. Food is cooked on a metal grate placed over charcoal. Thin mats serve as beds. People bathe and wash clothes in metal drums filled from a community well. Traditional villages comprise single-story houses made of white stone. They have a kitchen, a sitting room, bathroom, and small bedrooms. Many homes have vegetable gardens and are enclosed by a high wall with a gate. Wealthier people can have two-story homes, the upper level used for living quarters and entertaining, the bottom for utilities and storage. The main meal is eaten between 2 P.M. and 3 P.M., and may include falafel, sandwiches made with balls of deep-fried chickpeas, hummus, or grilled lamb sandwiches, called shwarma. Pita bread is a part of every meal. 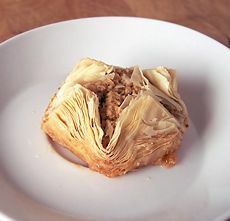 Lamb, eggplant, chicken, and rice are commonly eaten, as are baklava pastries, made with honey and almonds or pistachios. Palestinian men drink coffee or tea together as a social activity. Mensaf, a large platter of rice covered with a lamb or goat stew and pine nuts, is served at weddings, feasts, and funerals. Islamic laws and customs forbid painting of people and animals, so most Arab designs feature plants, leaves, or geometric shapes. Many Muslims are skilled in calligraphy and illustrate verses from the Kor'an in designs and sell them at art shows. Craftsmen sell woven carpets and tapestries, leather goods, pottery, and ceramic jars to tourists. Writer Mahmoud Darwish is highly political and deals with the Israeli occupation. His Identity Card, one of the best-known works by a Palestinian, has been translated into the major languages. He also composed Palestine's Declaration of Independence. In The Wind-Driven Reed and Other Poems, Fouzi al-Asmar evokes the Palestinian longing for a homeland. Palestinian-Israeli writer Emile Habibi, a representative in the Israeli Knesset, began writing when a leading Israeli politician said that the Palestinians did not exist; otherwise, they would have produced their own literature. Habibi wrote a series of short stories and novels. Palestinian-American Edward Said, a historian and essayist, explored Palestinians' problems and aspirations in Peace and Its Discontents and other books. Other highly regarded émigré writers include Liana Badr and Hassan al-Kanafani. Fiction writer Ghassan Kanafani depicts the aimlessness and desperation of Palestinian refugees in short stories in All That Remains: Palestine's Children. The works of many leading Palestinian writers are translated in Salma Khadra Jayyusi's Modern Palestinian Literature. Palestinian music is one of many regional sub-genres of Arabic music. While it shares much in common with Arabic music, both structurally and instrumentally, there are musical forms and subject matter that are distinctively Palestinian. Early in the twentieth century, most Palestinians lived in rural areas, either as farmers or as nomads. Farmers (fellahin) sang a variety of work songs, while fishing, shepherding, harvesting and making olive oil. Traveling storytellers and musicians called zajaleen were also common, known for their epic tales. Weddings were home to distinctive music, especially the dabke, a complex dance performed by linked groups of dancers. Popular songs were in widely-varying forms, especially meyjana and dalauna. After the creation of Israel in 1948, most Palestinians fled to, or were forced into, refugee camps. The centers for Palestinian music were in the Israeli towns of Nazareth and Haifa, where performers composed in the classical styles of Cairo and Damascus. The shared Palestinian identity first arose during this period, and a new wave of performers emerged with distinctively Palestinian themes, relating to the dreams of statehood. The Israeli government exerted considerable control over Palestinian music recordings, and many of the most popular cassettes were distributed through the black market. Late in the 1970s, a new wave of popular Palestinian stars emerged, including Sabreen and Al Ashiqeen. After the 1987 Intifada, a more hard-edged group of performers and songwriters emerged, led by El Funoun, a songwriter. In the 1990s, Palestinian cultural expression began to stabilize. Wedding bands, having long since disappeared during the fighting, reappeared and played popular Egyptian and Lebanese songs. Tania Nasser soon emerged as a major star, and became well-known for her support of feminism among Palestinian women. Beginning in the late 1990s, Palestinian youth forged a new Palestinian musical sub-genre—Palestinian rap or hip hop, which blends Arabic melodies and Western beats, with lyrics in Arabic, English, and even Hebrew. Young Palestinian musicians tailored the style to express their own grievances. DAM were pioneers in forging this blend. As Arab citizens of Israel, they rap in Arabic, Hebrew, and English often challenging stereotypes about Palestinians and Arabs head-on in songs like "Meen Erhabe?" ("Who's a terrorist?") Other Palestinian hip hop artists include members of The Philistines, N.O.M.A.D.S, MWR, and the Palestinian Rapperz. The Great Mosque (Al-Omari Mosque), located in downtown Gaza City, is a tourist attraction. The mosque has a splendid minaret, reputedly occupying the site of the first ancient temple of Marnas and then a Greek Orthodox Church. The mosque was also the site of a Norman church built by the Crusaders in the twelfth century. Napoleon's Fort (Qasr El-Basha), also located in downtown Gaza, is an imposing stone building dates back to the Mamluk period. It is known as Qasr El-Basha because Napoleon spent a few nights here on his way through the town in 1799. Saint Porphyrus Church, is a fourth century church where Saint Porphyrus died and was buried (420 C.E.) It is located in the Gaza's old city and is still in use today by the Greek Orthodox Community. The Al-Sayed Hashem Mosque, located in Al-Daraj Quarter, is one of the largest and most beautiful ancient mosques in Gaza. The tomb of Hashem bin Abd-Manaf, Mohammad's grandfather who died in Gaza during a trading voyage, is believed to be under the dome of the mosque. CIA World Factbook. "Gaza Strip" (current) online . Retrieved September 4, 2008. Gaza Strip CIA World Factbook. Palestine, West Bank, and Gaza Strip Countries and Their Cultures. Gaza Strip at Google Maps. This page was last modified on 23 May 2017, at 22:18.